You'll discover tucked-away gems like Kirra Beach and Burleigh Head National Park. Explore Gold Coast's surroundings by going to Byron Bay (Belongil Beach & Spas & Wellness). There's much more to do: enjoy the sand and surf at Kurrawa Beach, enjoy the sea views from Captain Cook Memorial and Lighthouse, tour the pleasant surroundings at Surfer's Paradise Beach, and play a few rounds at Surfers Paradise Golf Club. 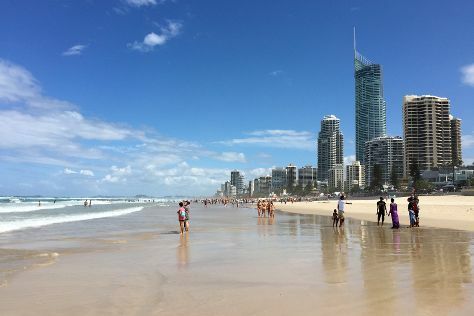 To find where to stay, more things to do, maps, and tourist information, you can read our Gold Coast day trip site . Expect a daytime high around 32°C in December, and nighttime lows around 22°C. Cap off your sightseeing on the 9th (Sun) early enough to travel back home.